Italian sculptor. He was one of the founders of the Sienese school of sculpture in the 14th century. The first documentary reference to him is on 23 May 1302, when he purchased land in Siena; in the same year, on 18 June, he paid tax on this purchase. 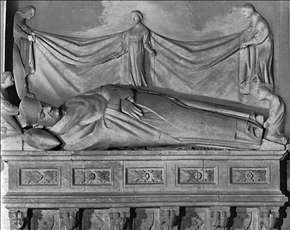 His only certain work is the signed tomb monument (Casole d Elsa, Collegiate Church) of Tommaso d Andrea, Bishop of Pistoia. It was probably executed in 1303-04 and is the earliest existing example of a complete Sienese funerary monument. Facing it, and possibly executed by Gano not long after, is the wall-tomb of Porrina, Lord of Casole and Radi di Montagna (d 1313). The portrait of Porrina is remarkable for its realism, and the tomb is unique among Tuscan sculpture of this period in that it presents a full-length standing figure beneath a Gothic canopy. Several documents dated between 1311 and 1313 record Gano as a tax-payer in Siena, and in 1316 he was mentioned in a document as an owner of land valued at 283 Sienese lire. Although no further works are documented, a number of attributions have been made on stylistic grounds. These include the tomb of St Margaret of Cortona (Cortona, S Margherita), together with two further works in Cortona: a marble statue of the Virgin and Child (Cortona, Museo Diocesano), from the faade of S Margherita, and a series of small marble relief busts of Saints and Christ Blessing (Cortona, S Margherita), discovered in an 18th-century pedestal of a statue of St Margaret. A marble slab carved with narrative reliefs of three scenes from the Life of Beato Gioacchino Piccolomini (c. 1308-11; ex-S Maria dei Servi, Siena; Siena, Pinacoteca Nazionale) has been attributed to Gano, as have some of the busts at the tops of columns and pilasters in the windows of Siena Cathedral. Also attributed to him are the full-length standing statues of the Virgin and Child with SS Imerio and Omobono (Cremona Cathedral). Eleven statuettes of Prophets and Saints (Massa Marittima Cathedral) have been added to Gano s oeuvre and placed in the last years of his activity. The sculptor died before 1318, as in that year his children Agnese and Ganuccia are described as heredes Gani magistri lapidum . See more details about "Tomb of Bishop Tommaso d'Andrea "
See more details about "Tomb of Ranieri del Porrina"
See more details about "Virgin with Child"